Hi everyone. Krista Sahlin of Sahlin Studio posting on Andrea’s blog to share my newest product at ScrapMatters. Are you looking for that perfect holiday gift? gift for significant others, parents, grandparents or yourself. I have a great idea for a classic, timeless gift that will be enjoyed everyday. A gorgeous piece of artwork. And by artwork, I mean a canvas print of your loved ones. textures, grain, meaningful text, custom images and color to create an image perfect for printing on canvas. Perfect to create the gift of a lifetime. A custom canvas art design to display in your home, office or any place needing beautiful art work. There are other examples in the Custom Canvas product listing in my shop at ScrapMatters. I will work with you to design a custom canvas art work beautiful enough to display in the finest of galleries. Whether you want a canvas of each child, your wedding photo, your family, the kids together or all of the above. These also would be beautiful done with photos of your home, cabin or favorite vacation spot. I’ve created a multiple canvas discount, because when I am working on a canvas I have all of my “tools” out and it is extra easy to just change out images and start working on my next custom canvas design project. It is much easier to do two or three in a row, than it is to do one today and the others tomorrow. Pricing includes the custom digital canvas design. You are able to your take your design to a printer of your choice or I can help you select a printer. I’ve found canvas printing prices to be very affordable (who knew?) Canvas printing ranges by size and company (I have found superior quality work that can be printed around $30-$55). Which makes your CUSTOM artwork only around $85 for a 12 x 12 print (custom designed, printed and shipped) to your home!! Can you think of a better gift?? And SO original!! Here are some more detailed pictures of canvas prints that are gallery wrapped. When a canvas is “gallery wrapped” the printed portion of the canvas continues around the sides and the back. No frame is needed to display your custom print. Here is a picture of how several canvases look displayed in my home. I designed and printed them at 12 x 12. Finished custom canvases on display. Order your Custom Canvas Design TODAY! And get a head start on your holiday shopping! Pamper yourself or your friends with this fabulous gift pack by Kari. This birthday can from Jaime is super cute! What a fun way to present a gift. Found this cute teacher gift in the gallery. What teacher wouldn't want this? Well hopefully I’ve whet your appetite on all of the fun stuff you can do with hybrid. 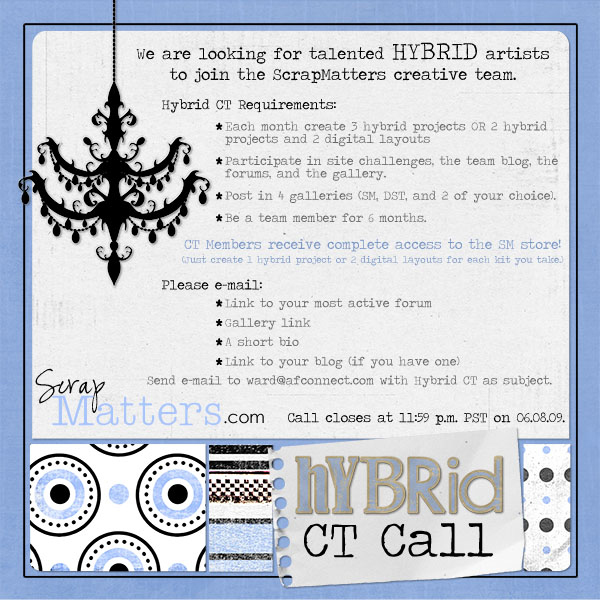 If you are a paper and glue girl you will love creating for the hybrid team. This call closes at 11:59 p.m. PST on Monday, June 8. We hope you will apply! 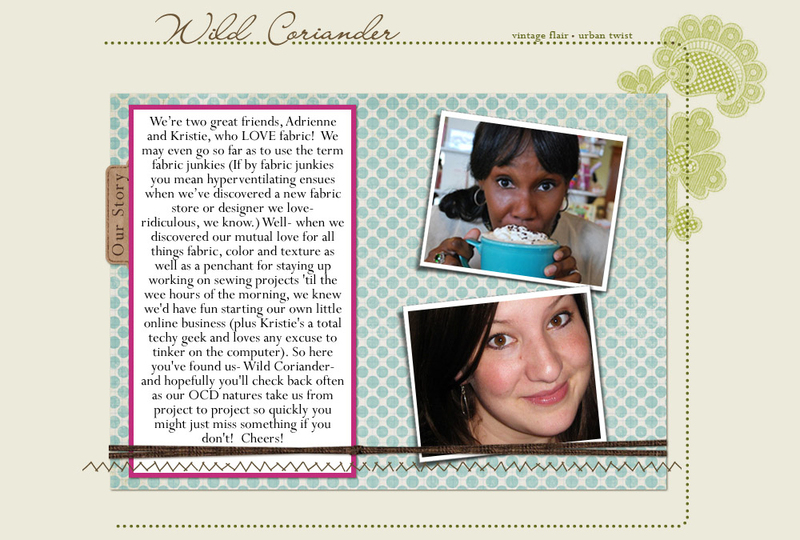 My friends Kristie & Adrienne started this totally fun, online boutique, called Wild Coriander. Kristie & Adrienne--a couple of my creative friends. Kristie (krisser12) is so talented, you may remember her from when she sold at ScrapMatters as Suzie Belle Designs. I love her design sense and was so sad when she quit designing digital scrapbook kits. However, knowing Kristie something spectacular is always going on in that creative mind of hers. I was so excited to see this next venture. These bags make terrific diaper bags, but I really want one for the beach in Hawaii next month. My mind is churning with the possibilities. Is yours?